Stormy | Pump That Pedal - We've got it, You want it, Come and get it. Last of the last brake failure clips with Stormy, at last! The very last time we shot with Stormy, we filmed a 3-part series of short brake failure clips. This is the second of them and quite frankly, I completely forgot they existed until a few months ago. The very last time we shot with Stormy, we filmed a 3-part series of short brake failure clips. This is the first of them and quite frankly, I completely forgot they existed until a few months ago. This is stormy’s first time driving the Bronco, and it’s not an easy task! She’s dressed very casual – her bathing suit top, short shorts, and some flip flops. In this custom video that we did with Stormy last year, she gets into the ’79 Bronco and it won’t start. She is puzzled and frustrated. When she does get it started, it doesn’t go far before stalling out on her and causing her more trouble! Here’s a quickie video clip I found of stormy from a long time ago! She’s revving her 64 1/2 Mustang in my black over-the-knee boots. This is a very short bonus clip we got of stormy revving her Mustang before leaving to do a driving video . . . enjoy, as it is our last video clip we have of her, and she’s no longer with PTP. Stormy takes a cruise in her 64 1/2 Mustang for this custom video she did. We offer this short snippet from the full-length video to the members here at PTP. 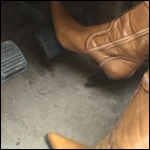 Watch her painted-red toenails scrunch up as her foot presses the gas pedal to accelerate. Stormy has to take the Bronco to work this time, but she’s having more trouble with it than she bargained for. It’s an odd vehicle to her, so she’s not used to it and how it does. When she finally does get it started, she does a few quick revs…. Stormy visit’s this local fire department to get some cute revving in a fire truck. She’s dressed in jeans, a tight-fitted top, and her footie socks! She’s in a silly mood at the beginning of this clip.